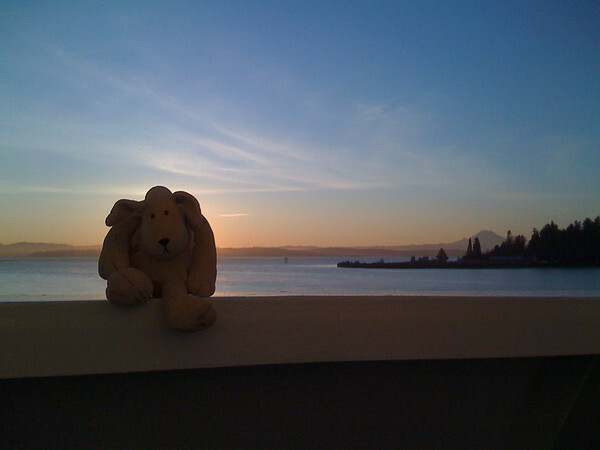 bzimmer.ziclix.com / Sun, mountains, animal. So many old friends came out today, the sun, blue skies, Mt Rainier and an animal! I made an animotion for my daughter over the weekend and it clearly re-sparked her interest in sending animals on the "big boat". I arrived at the boat late, making only the last loading (after the cars) therefore missing the clear shot of the Cascades without the blinding sun — it didn't matter, I was thrilled for a sunrise! Our friend (unnamed) in a perfect sun-blocking position with Mt Rainier standing proudly. All the mountains were out today, Rainier, Baker and the Cascade and Olympic Ranges. 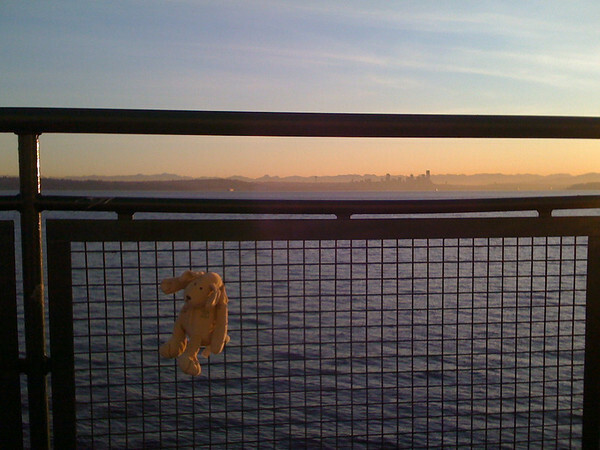 Seattle glowing in the background; an arm twisted in the railing "for safety". I've received a tremendous amount of positive feedback for the TWL animotion, so, confident with past success, here's another dedicated to the animals and their adventures.